If the Seahawks let Richard Sherman walk in free agency, could the compensatory be more valuable than a potential return in a trade? With a tiny little lull in the NFL calendar — things will heat up again in two weeks when the NFL Combine is held in Indianapolis — it’s time to answer a few questions from Twitter about the Seahawks. And as always, you can send yours to @bcondotta. A: Sherman’s situation is pretty cut and dry at this point with just one year left on his contract. He has a $13.2 million cap number for 2018, of which $2.2 million is dead money, meaning Seattle could save $11 million by releasing or trading him, either before June 1 or after. But while I understand why having $11 million extra to spend in free agency might be tempting, I don’t really get the idea of just cutting Sherman. If Richard Sherman is healthy — and he said last week he will be and other than this one injury he’s been exceedingly durable so there’s good reason to think he’ll recover as he says he will — then I don’t see how the Seahawks aren’t better off keeping him. In other words, what are you going to get for $11 million in free agency that could help you more than a healthy Richard Sherman? And if Sherman doesn’t re-sign with the Seahawks and goes elsewhere in free agency next year, then the Seahawks can be pretty certain of getting a third-round compensatory in 2020, which might be better than what you’d get if you tried trading him right now (and remember that comp picks can now be traded, making them a little more valuable to compile). Since the Seahawks’ brass has said almost nothing since the season ended, it’s hard to get a complete read on their thought process on a lot of these things. But my view is that Sherman is likely to be with the team in 2018. Beyond that, though, is much more uncertain. How likely is it sherm is going to play under his current deal? A: As noted above, I think Sherman will be a Seahawk in 2018 (while acknowledging that a whole lot could still happen). But if your question is suggesting that Sherman might hold out, that won’t happen. Sherman is coming off a significant injury and can be an unrestricted free agent following the 2018 season and he knows he has to come back and show everyone he is healthy and can still play to the same level he always if he wants to get the kind of big contract following the season that he wants, whether it is in Seattle or somewhere else. Also, given his injury, I can’t imagine him doing anything to risk what is still a significant payday from Seattle next season — a base salary of $11 million that he has to play to get. 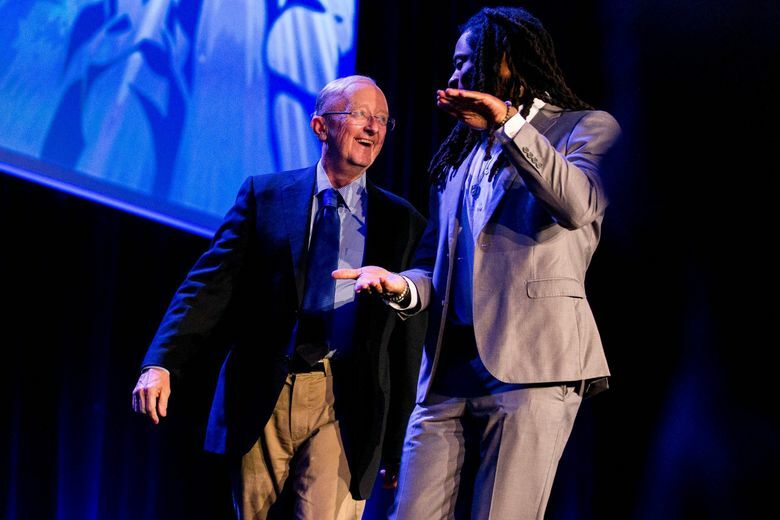 When he spoke to a few local reporters last week at the Seattle Sports Star of the Year banquet, Sherman — who turns 30 on March 30 — said his goal is to play at least five or six more years, whether it’s with the Seahawks or somewhere else. I think Sherman is practical enough to understand his best course of action to getting that done at this point is to put his head down, get healthy, play well and then let the future take care of itself. If your question is wondering if the Seahawks and Sherman — who is representing himself — will come to an agreement on an extension before the season, I think the odds of that are much lower for the reasons noted above (age, injury, mainly). There’s not much reason to think Sherman would do anything to take a pay cut in 2018, and representing himself makes him that much more motivated to get the biggest possible deal he can, which in his case may mean betting on himself, and at the risk of repeating myself, showing he’s healthy and still one of the best cornerbacks in the NFL in 2018. If we lose Graham, Sheldon, Bennett, and Avril this year, what kind of compensatory picks would you see us getting back? A: This question serves as a good way to refresh the basic rules on compensatory picks. Comp picks are only awarded for losing unrestricted free agents. Of the four players listed above, only Graham and Richardson will be UDFAs beginning on March 14. Bennett and Avril remain under contract and the only way the Seahawks move on from them this year is if they release them, trade them or they retire. So there’s no possible comp picks coming for Bennett or Avril. As for Graham and Richardson, Seattle’s hope is that if they sign elsewhere that each would net a third-round pick in 2019 — the highest a team can get. But it’s also worth remembering the comp pick formula (which is complicated and cloaked in some secrecy but which you can read all about here via a really good breakdown from OvertheCap.com) is based on overall gains and losses in free agency. So if Seattle loses Graham and Richardson but then re-signed two players of perceived equal value under the formula, then the Seahawks wouldn’t get anything. The thought, though, is that the Seahawks do want to turn Graham and Richardson into high comp picks if they lose them. And that, combined with not having a whole lot of cap space at the moment (roughly $14 million) is why it’s generally thought the Seahawks aren’t likely to be big players in free agency, potentially doing their most spending on re-signing a few of their own players (Thomas, maybe Sherman, etc. ).